Like many awesome people(Skywalker, Kent and err, Schrute to name a few) I come from a family of farmers, spending many a summer riding tractors, toiling away on fields of cucumbers & tomatoes and poking half dried cow pats with a stick. So my farm boy credentials coupled with a passion for simulation games has made the Farming Simulator series something of a curio for me. I purchased Farming Simulator 13 on a whim, expecting to get the kind of ironic enjoyment usually reserved for the guiltiest of pleasures, instead I found myself, ironically, genuinely enjoying it. Now the latest instalment has arrived in the form of Farming Simulator 15 with an updated engine, a load of new toys to muck about with and new activity in the form of forestry to delve into. Your time with Farming Simulator 15 starts like it did in 13, with you being unceremoniously dropped into middle of a farm, your farm. This time however you are given a choice of 2 open world maps to begin your career on, the American styled Westbridge Hills, replete with white picket fences and iconic red barns or the Nordic themed Bjornholm, filled with rustic log cabins and forest areas. While it has no real effect on the gameplay, its nice to be given a choice of backdrops even though, at times, the two environments can be indistinguishable. You’re also bestowed some farming machinery to compliment your newly acquired farmland, which means you’re now ready to set out on your journey to become the agricultural kingpin you’ve always dreamed of. Unsurprisingly the core gameplay remains unchanged from the previous game, you’ll be spending the bulk of your first few hours continually cultivating your field in preparation to receive your seed, followed by a good seeding and then a harvesting of the crops, eventually storing the results in your silo or selling the spoils to various locations across the land. The majority of the activities play out in much the same way and while it may not be for everyone and can occasionally get repetitive or feel mundane, there is a calming, relaxing and charming fun (yes, fun!) to be had with it. 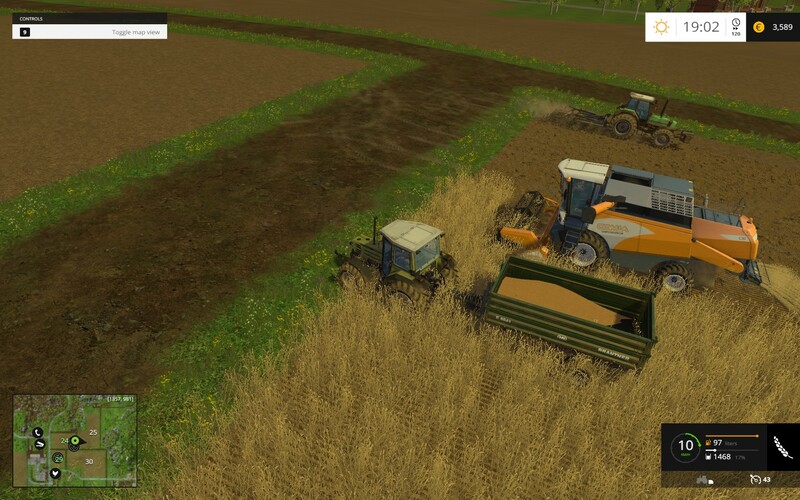 Having no real say in the machines you start with, initially you will be forced to focus on certain crop types until you can afford to buy the implements specific to other types. Given the number of options available to make money, it seems odd to start every game with the same base set of equipment, it would have been nice to have been given a budget and allocate it to whatever you want to start with (you can sell your starting equipment, albeit at half its value) it seems like a missed opportunity considering it was the same situation last time around. While a set start can make it feel as though a lot of content is locked out until you put the time in to afford them, it presents the core progression system of the game that essentially boils down to ‘make money to spend money to make money’, which to be fair is basically how a farm works. This does lead to a lack of immediacy, for those looking for instant gratification you wont find it here, its a slow cook, rewarding those who are willing to ‘grind’ to get better equipment. With some commitment and some serious agronomic skills, you’ll find yourself acquiring more tools with which to derive some more cash, these include different attachments to adorn to your tractors, telehandlers/forklifts to complete delivery missions that crop up from time to time(the frequency of which can be changed in the options), cows and sheep for animal husbandry, placeable objects like turbines and bee hives, in fact far too many things to mention in this review(over 140 items can be purchased, hopefully more to come with the ‘out of the box’ mod support). Everything you own on your farm put’s a drain on the money in your account, equipment and items have maintenance costs, animals have upkeep costs, hired workers require a salary, this adds an interesting management angle to the game. With both money and time management being integral to the success of your farm you will find yourself planning your next purchases and acquisitions more and more, deciding on crop rotations as a couple of examples, these choices a dash of strategy to proceedings. While not exactly deep it does exemplify that some thought can be put into decisions beyond “must buy bigger badder tractor”. Despite the money hemorrhaging from your account there’s no real sense of urgency to the game, you can take out a loan from the bank, but it never feels like they’re going to “send some guys round”. There aren’t any rival farmers to compete against or undercut at the market. This leads to the game having an almost leisurely pace, which to be honest is no bad thing but could be off putting to many especially those looking for instant gratification from their games. As can be expected from a game about agricultural prowess, you’ll find yourself on occasion literally watching grass grow, thankfully you have the option to speed up the passage of time.There is a day/night cycle which doesn’t impact the functioning of your farm, weather conditions do. 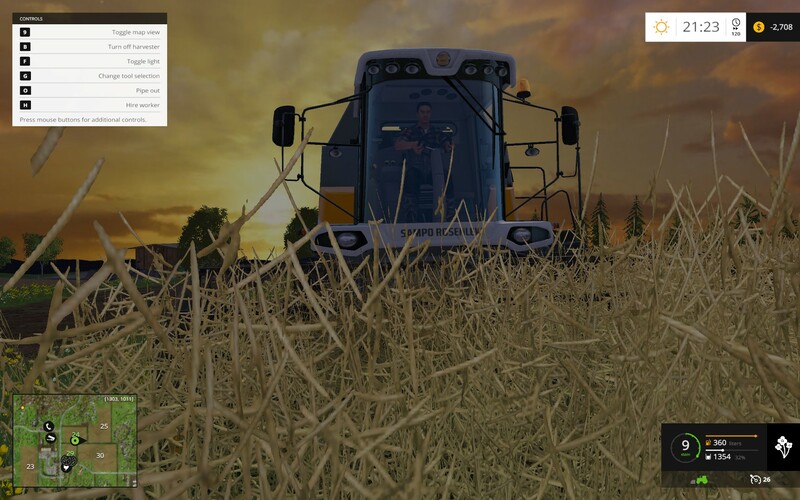 Rain and hail will halt harvesting completely, you can get a week long forecast from the information screen, as well as crop growth, vehicle locations and some other details. More importantly the prices at which produce sells and the locations that buy them can also be found here. These prices fluctuate other time and its a good idea to keep an eye on it, although if there is a high demand for something you will get a notification for it. The interface can feel cumbersome, clicking arrows to navigate the various pages where tabs would have been better, though the information itself is well presented. The biggest new addition and one that I was greatly looking forward to is forestry. Grabbing a chainsaw, slicing through a tree and watching it fall to the ground is quite satisfying, forestry equipment itself is expensive (and super cool) but that’s balanced by the substantial amount of money obtained from selling trees. 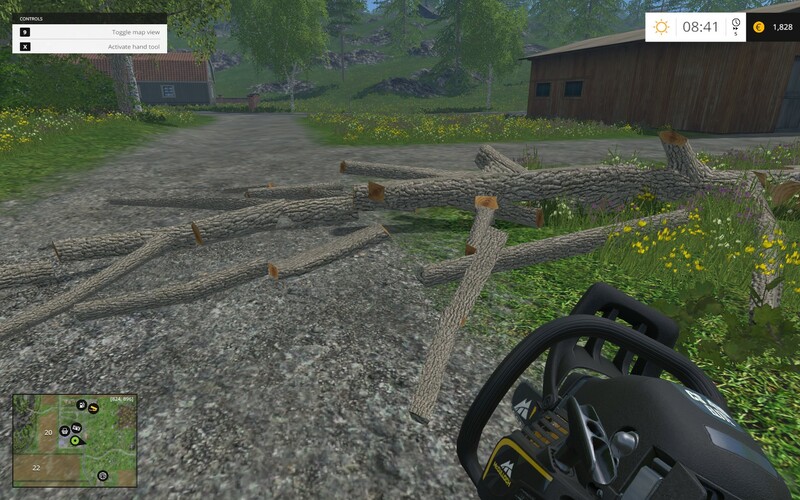 But while it is great fun playing lumberjack, manipulating logs can at times feel clunky and fiddly. Graphically the game is functional for the most part, the environments being rural, are sparse, textures are hit or miss, with some areas looking flat and uninspired, various buildings and landmarks scattered around the landscape add much needed variation to the green hills, brown fields and trees, villages are inhabited by NPCs with character models that are stiff and lifeless, faces affixed with stony gazes usually reserved for the most mediocre episode of Emmerdale. The stars of the show however, are the beautifully modelled and highly detailed machines and tools you’ll be using, its obvious a great deal of care and attention has been put into them solidified by the great sounds the whir and rev from them. Little details like the way mud slowly collects on your vehicles and tools overtime and tracks left by your vehicles while pointless add so much to the authenticity. Everything reacts with, some degree of success, the decent but sometimes bat crap crazy physics engine (toned down compared to the previous game) which can at times lead to vehicles becoming stuck or unusable. Handily though you can reset them to your farm through the info screen so isn’t much of an issue. Multi-player returns with the server population limit increased from 5 to 16. It’s where I spent the majority of my time with the game, and is where it really shines, coordinating with your fellow players to get a harvest up, each person doing their assigned job singing “Combine Harvester” in a west country accent (it does however grate after the 500th time). Everything available in the single player campaign is available here too. Its tonnes of fun and incredibly satisfying getting a group of like minded people together and running a well oiled farm. And if you get bored you can always race tractors. Over the course of this review one thought was at the back of my mind, “this review is probably moot”. Fans will buy it regardless, and its doubtful it will convince fence sitters let alone people who have zero interest in it. So how do you recommend a game that could be considered niche within the already niche genre of simulators? A farm boy like me enjoyed it despite having ‘worked’ on a farm, and if it come down to it, you could always pretend you were Skywalker, Kent or yes, even Schrute. 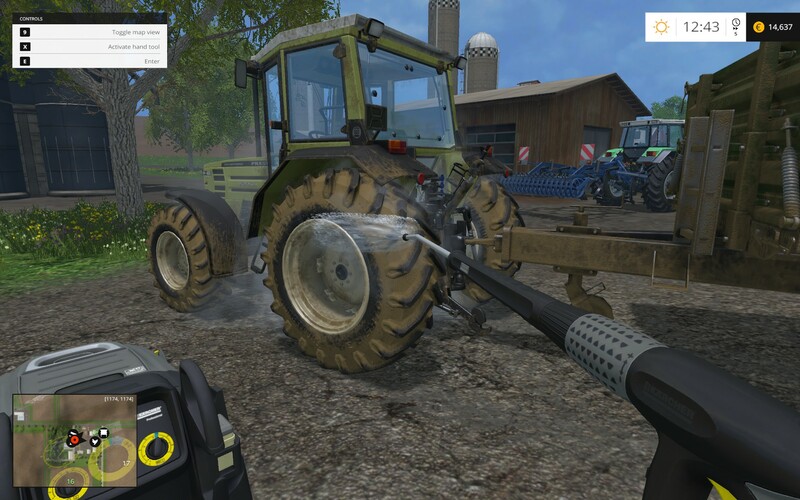 FS15 isn’t as significant departure from 13 as I would have hoped. 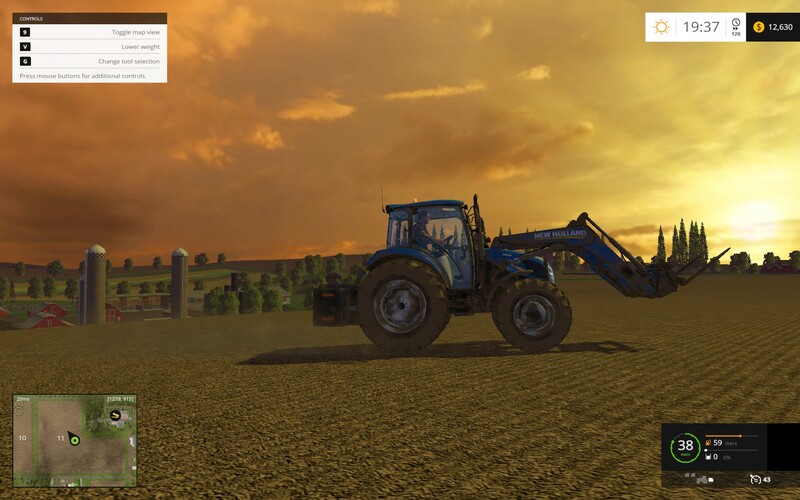 But despite its occasionally wonky physics, sub par graphics (minus vehicle/tool models) and gameplay that many would consider repetitive and boring, it offers a fun solid simulation of the seedy world of agriculture for fans of simulation games. With the added forestry activity being a enjoyable, if glitchy, distraction and a great multiplayer experience rounding it out. You’re enjoyment of it however, will stem from how much time your willing to commit to it.